We’d love your help. 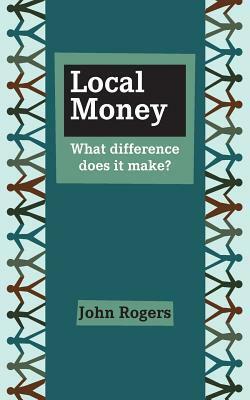 Let us know what’s wrong with this preview of Local Money by John Rogers. To ask other readers questions about Local Money, please sign up. Must-read pamphlet. I found it clear, concise, assertive, inspiring and timely. Miraculously, John Rogers has distilled everything you need to know on this subject into this very easily digested little tome. Seriously impressive. I recommend it to Transition Initiatives and community groups anywhere that are looking at reasserting control over their local economy. "People Money - the Promise of Regional Currencies" was co-authored with Margrit Kennedy and Bernard Lietaer, who wrote the 2004 German original on which this first English edition is based. John completely expanded the original text to include profiles of 16 leading local currency systems from around the world, based on 40 interviews. He also added his unique ORDER design methodology for local currencies. "Local Money - What Difference Does It Make?" is a shorter pamphlet written as an introduction for newcomers to the field. It explains the differences between national and local currencies, why local currencies are needed and examines arguments for and against them.